Handicap and disability are closely related terms which are often used concerning people with special needs. As they are very close synonyms, they are usually interchangeably used. In both situations, social stigma, low self-esteem, and support system issues may be experienced by the individuals. The World Health Organization (WHO) defines a handicapped person to have a loss or limited opportunities in being involved in activities as compared to the majority of the population. A handicap is the effect of a disability. It focuses on an obstacle experienced by a person due to a restriction in the environment. The word “handicap” is said to have originated in 1504 when King Henry VII proclaimed that disabled veterans can legally beg. With their “cap in hand”, people with disabilities went to the streets; hence, “hand-in-cap”. However, several authors claim that this is a false origin of the term. Most sources claim that the origin is a lottery game called “hand-in-cap” which was played in the 1600s. Basically, the barter game involved putting forfeit money into a cap and the owner of the less valuable item has to pay up. The term then evolved to “hand i’cap” which became “handicap”. Overtime, “handicap” was linked to equity as it was commonly used in sports to make a certain competition fairer. For instance, faster horses were made to carry weights so they could be more on par with the slower ones. The term became widely understood as a way or condition to limit or impede. In 1915, “handicap” was first employed in connection with disability when it pertained to children with mobility impairments. In the 1950s, “handicap” was also applied to adults as well as those with intellectual disabilities. In the 1970’s, “handicapped” had been the legal term concerning social services. WHO defines a disabled individual to have any lack of ability in carrying out an activity in the means viewed as normal by the community. A disability is a reduced capacity to specifically perform a movement, detect certain sensory information, or execute a cognitive function. It is generally a lifelong condition such as blindness, intellectual disability, and cerebral palsy. For instance, a person who was born blind will likely experience restrictions in reading, navigating, and other related activities in his lifetime. As the term “handicap” was associated with begging, a number of groups felt that it was not appropriate. In 1990, the American with Disabilities Act was passed and “handicapped” became passé. The activists who fought for the act chose the term “disability” as an acceptable euphemism. Being handicapped denotes an external source as it is focused on the obstacle in education, communication, occupation, and other kinds of environment. On the other hand, being disabled is internal as it is centered on an individual’s reduced capacity to perform certain activities which is mainly attributed to illness, accidents, trauma, heredity, and other related conditions. 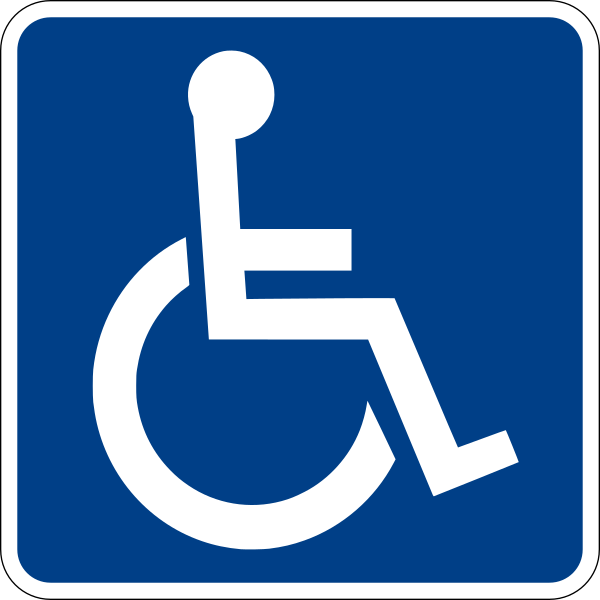 As compared to being handicapped, being disabled is more centered on the lack or restriction of ability to accomplish an activity. As compared to being disabled, being handicapped is more focused on the loss or limitation of opportunities. Generally, being disabled may face more challenges than being handicapped as the former concerns “inability” while the latter deals with “difficulty”. Hence, a handicapped situation reflects partial disability while a disabled condition communicates helplessness. A loss of function of a body part is more closely associated with handicap than disability. This may be also due to its well-known wheel chair symbol. Handicap is more often associated with sports as it covers having a disadvantage in professional sport such as tennis handicap, golf handicap, and the like. As compared to “handicap”, “disability” is more politically correct. 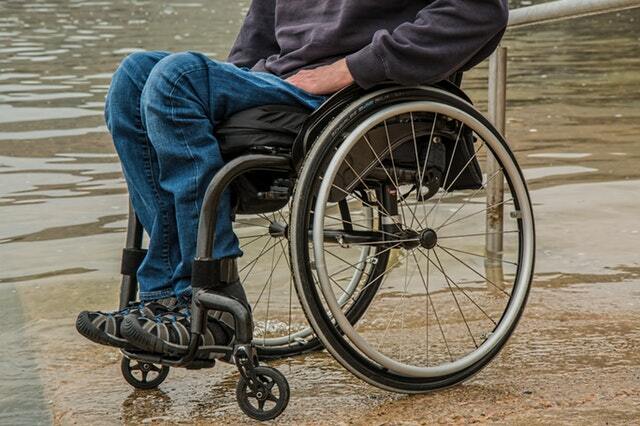 Many feel that the term “handicap” is condescending. In fact, some dictionaries define “handicap” as “sometimes offensive” as it is associated with begging. Handicap is the consequence of disability as it is the experienced disadvantage. On the other hand, disability is the condition of having a reduced capacity to perform. Handicap as a term has a longer history as records show that it was first used in the 1500s-1600s. On the other hand, “disability” has a shorter history as it only replaced “handicap” in 1990. 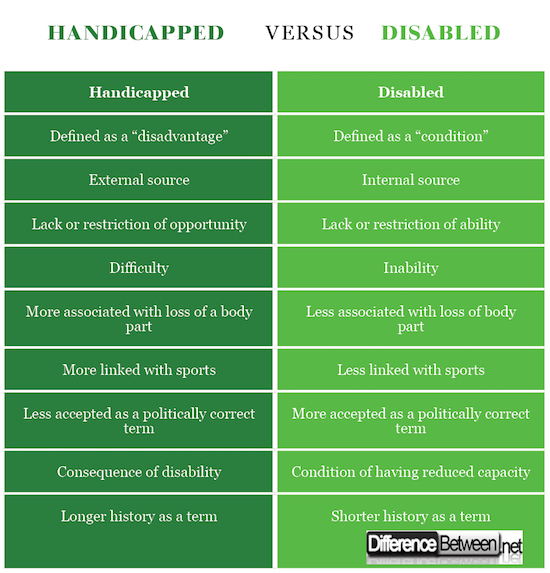 Since the difference is very subtle, handicap and disability are often used interchangeably. Handicap is having the loss or limited opportunities in being involved in activities as compared to the majority of the population. Disability is the lack of ability in carrying out an activity in the means viewed as normal by the community. Handicap is defined as a disadvantage and a difficulty while disability is defined as a condition and inability. As compared to being “disabled”, “handicapped” is more offensive. As a term, “handicap” has a longer history as compared to “disability”. gene balinggan. "The Difference Between Handicapped and Disabled." DifferenceBetween.net. April 5, 2018 < http://www.differencebetween.net/language/the-difference-between-handicapped-and-disabled/ >. Adams, Rachel, Reiss, Benjamin, and Serlin, David. Keywords for Disability Studies. New York: NYU Press, 2015. Print. Davis, Lennard. The Disability Studies Reader. Routledge, 2016. New York: Print. “Handicap.” Def.1. Merriam-Webster.com. Merriam-Webster Dictionary, 2018. Web. 27 March. 2018.